There seemed to be an attempt to re-brand yesterday's Manchester United v Everton game as the "Davie Moyes Derby." A re-branding exercise that dripped with sarcasm. A new conventional wisdom is popping up that places Manchester United's decision to appoint Moyes as a catastrophic error not just in hindsight but because they should have been able to see that he'd been a crap at Everton in the first place. There's a harsh revisionism of his achievements taking place that is really not deserved. His season at United was a disaster. Can't argue with that. Sir Alex Ferguson's perception of his own powers extended to the rewriting of history. I think he'd almost begun to see Manchester United as a gift passed from Sir Matt Busby to him. Forget the years of failure in between. One canny Scot to another canny Scot. Where else do you turn but another canny Scot? That the Scot in question was likely to be so respectful that he wouldn't question the glaring gaps in Ferguson's legacy was probably even better. Or maybe Ferguson's humility - admittedly a little seen humility - kicked in. Maybe he really didn't realise that it was basically his influence that carried United to his last title and he thought Moyes could pick up where he left off. Moyes couldn't. And he faced a double whammy: United fans used to success were bereft and fans of every other club, so used to United's success, were gleeful. Moyes seemed unable to grow in the role and United - dazed and confused at the loss of Ferguson - seemed to suffer a collective collapse of confidence. The players didn't like what they were seeing, the season drifted away and Moyes looked ever more haunted on the touchline. United were forced to act. Moyes was sacked. And that simply confirmed the idea that had grown over the season that Manchester United were particularly stupid for listening to an out of touch Ferguson and giving the job to a hapless managerial Inspector Clouseau. 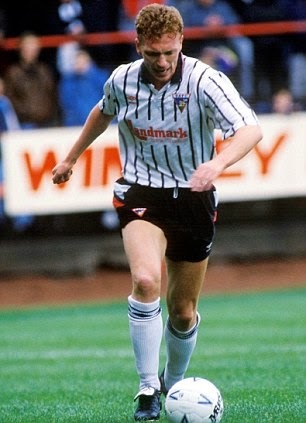 Which, as Daniel Taylor pointed out over the weekend, left Moyes dealing with both the biggest catastrophe of his career (as a manager, I well remember him losing the 1991 League Cup to Hibs as a Dunfermline player) and the stigma that everything he'd achieved in his career up to that point was a mirage anyway. Sir Alex Ferguson's place in the pantheon of managers will be debated for a long time. But we can say that his was a unique career in its longevity and because it spanned football's transformation into a multi-billion pound global entertainment industry. A hard to act to follow. United need a giant personality, Moyes isn't that. Louis van Gaal could be but even he might currently attest that it's not the easiest gig in the world. David Moyes would probably never need to work again. No financial issues there and who needs the stress? But he surely work again. There must be chairmen and chief executives in England and elsewhere looking at his work with Everton and wondering if he could do the same for them. If he wants to go through it all again he probably could. He might not want to. But it would seem unduly harsh if his dream job turning into a nightmare means he never gets another chance.